It's no secret that countless people throughout the U.S. celebrate the Fourth of July in various patriotic ways. Because of this, it wasn't surprising to see Hillary Clinton's inspiring July 4 tweets that celebrated diversity on this special holiday. But these three tweets not only invoked a powerful message about joining people together and building on our collective strengths; they attacked Donald Trump in a subtle way while spreading this inclusive (and patriotic) message, thus proving that Clinton and July 4 share a love of celebrating America's diversity, which Trump clearly does not have. 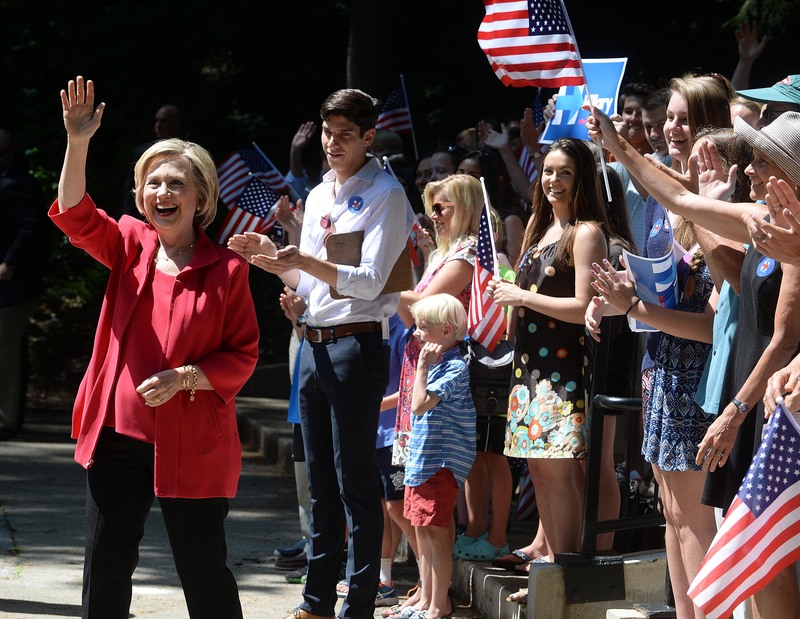 Clinton has increased her attacks against Trump as the general election draws closer, but simply looking at the two candidates' starkly different messages "celebrating" July 4 will show who is actually for the U.S., and who is for advancing their own platform. The presumptive GOP nominee's Twitter page was mostly filled with a string of tweets calling out "Crooked Hillary Clinton," defending his offensive Star of David tweet, and promoting his potential vice president picks. Trump only made room in his Twitter timeline for one tweet about the Fourth of July. "Today and every day, we celebrate our independence," Trump's succinct (and almost unnoticeable) holiday tweet read. Less than an hour after that tweet, Trump tweeted: "Dishonest media is trying their absolute best to depict a star in a tweet as the Star of David rather than a Sheriff's Star, or plain star!" But Clinton's message on the Fourth of July was clear: Unite Americans, celebrate their diversity, and let us not forget how far we've come. Rather than criticizing the media or advancing her presidential platform forward (in an overt way), Clinton instead focused much of her social media efforts on spreading a positive message about the rich diversity in the U.S. In his entire presidential campaign, which started in June 2015, I can't remember a single time that Trump shared a similar message celebrating diversity and "our shared values." Instead, Trump has built a presidential platform on spreading hateful, divisive messages that attack Muslims, Mexicans, and women, just to name a few examples. When Trump says "Make America great again," he's really spreading his parochial idea that America currently isn't great and that he, through whatever convoluted means, will supposedly make it that way again. Meanwhile, Clinton is using her Fourth of July tweets to share a message that clearly contrasts his views. By saying, "Don't let anyone tell you that great things can't happen in America," she's essentially addressing Trump by reminding him of all the great things we've achieved together (not alone, under a single Trump dictatorship) throughout history. Of course tweets can only be taken so seriously, and of course Clinton is trying to advance her own campaign by tweeting certain things. However, the two candidates' messages could not be more different, and on the one day a year when many U.S. citizens gather together to celebrate our freedom and diversity, it couldn't have hurt Trump's campaign to mention that in his July 4 messages.